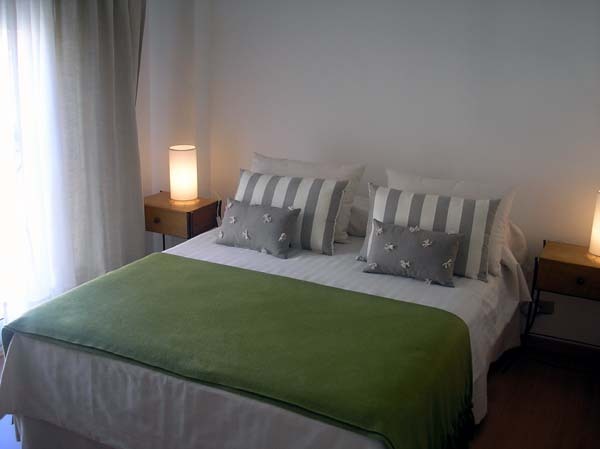 Nice and bright one bedroom apartment located in the most chic area of Recoleta, surrounded by the five stars hotels. The building is very elegant and 24hs security. The apartment is situated at the front of the building with a lovely balcony. It offers a bedroom with double bed, living-dinning room with a very confortable sofa-bed, and table and chairs. The kitchen is fully equipped and the bathroom is complete with bathtub and shower. Balcony, A/A, heating, cable TV, CD Player, Internet high speed. Kitchen fully equipped with refrigerator, freezer, toaster, coffe-maker, microwave, washing machine. Dishes and kitchen utensils. Towels and bed linen. Recoleta, Francia Sq., Las heras Ave., surrounded by many 5 stars hotels, restaurants, bars, pubs, museums, parking areas, residencial area, parks, nightlife area, laundrys, cinemas, banks, gym, lybrary, book stores, bus stops, commercial area, etc. Included: Electricity, gas, water, internet, telephone, city and building taxes.